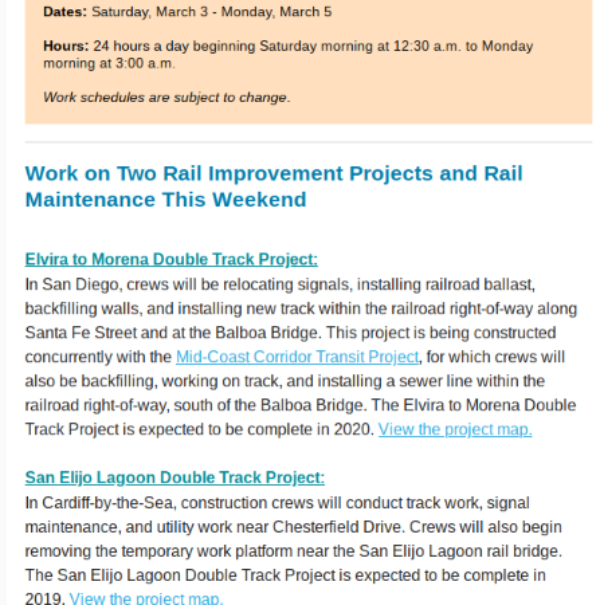 This is a notice online from San Diego County of the latest on going track improvement projects in the county. This will be going on for several more years. mtrak has temporarily canceled all services between Boston and Washington, the railroad corporation said Friday evening. Of the 106 trains scheduled to run between Boston and Washington — and the Keystone line connecting Pennsylvania and New York — all have been canceled or delayed, an Amtrak spokeswoman told CNBC. CHARLOTTESVILLE — After nearly a month, the last person hospitalized after the Jan. 31 crash between a garbage truck and an Amtrak train in Crozet has been discharged from the University of Virginia Medical Center. Hospital officials announced Monday that Time Disposal employee Dennis Eddy, who spent nearly two weeks after the crash in critical condition, has been released. Anderson said Amtrak trains currently travel over 222 miles of dark territory track nationwide, about one percent of its routes. At least some of that track is in New York, Vermont and Quebec, and is used by the Adirondack and Ethan Allen Express services, according to two industry sources. Freight railroads own most of the track over which Amtrak operates. Caltrain is trading long-delayed CBOSS for conventional PTC on its commuter rail corridor between San Francisco and San Jose. The Peninsula Corridor Joint Powers Board of Directors plans to consider the approval of a contract with Wabtec Railway Electronics, Inc. at its March 1 meeting to complete a federally-mandated safety upgrade to implement positive train control (PTC) along the corridor’s signal system. Caltrain has terminated a contract with Parsons Transportation Group (PTG), the firm responsible for designing and implementing a Positive Control System or CBOSS, after the agency said lack of the contractor’s progress threatened to delay implementation of the technology. WASHINGTON — Up to two-thirds of 29 commuter railroads nationwide will miss a Dec. 31 deadline for adopting automatic braking technology for their trains, a government watchdog said Thursday. Susan Fleming, director of physical infrastructure at the Government Accountability Office, told the Senate transportation committee that seven to 19 commuter railroads are on pace to miss the deadline for installing and training crews for technology that Congress required in 2008 in an effort to prevent crashes.The 29 commuter railroads carry 500 million passengers a year. If NJ Transit misses safety deadline, could Amtrak save the day? Amtrak could save the day for New Jersey commuters if NJ Transit is barred from operating on the tracks to New York Penn Station because a critical safety system hasn’t been installed. Instead of hopping on an NJ Transit train, commuters would hop on trains pulled by Amtrak locomotives and crews, Amtrak’s CEO told lawmakers on Capitol Hill Thursday. That’s what Richard Anderson proposed to members of the Senate Commerce, Science and Transportation Committee, in testimony about the progress railroads are making toward installing positive train control by the end of December. Trump doesn’t want to advance the project, known as Gateway, which would provide a crucial rail link between New York and New Jersey — in part because Schumer had held up the nomination of several of Trump’s nominees, according to people familiar with the president’s thinking on the issue. “This project is vital to fifty million people in the northeast corridor and to our American economy, and politics shouldn’t get in the way,” Schumer of New York said in an emailed statement. Committing funds to Gateway also runs head-on into the philosophy that’s driven Trump’s push for a trillion-dollar public works plan — that states and municipalities should bear more of the cost, and the federal government less, for much-needed upgrades to U.S. infrastructure. In a very astute, detailed article in OREGON BUSINESS, “Post-derailment, Oregon passenger rail struggles to get back on track” (2 March), this media source clearly understood the financial issues for the Cascade route between Oregon-Washington, as magnified by the wreck of Cascade #501 last December. However, what was so apparently lacking in this otherwise fine depiction of what ails state-supported corridors was a concise understanding of the causes, and importantly, how to correct them. Amtrak CEO Richard Anderson was questioned Thursday by the U.S. Senate Committee on Commerce, Science and Transportation. New Hampshire Senator Maggie Hassan wanted to know if there was a way for the company to address safety concerns without taking the critical Vermonter line out of service. Anderson admits keeping the line is economically advantageous to the company and it’s now looking at lower cost fixes. “We have an R&D project underway at Amtrak to determine whether we can use technologies from Europe that don’t require as much trackside investment but would give us speed restriction and signal location,” Anderson said. The National Transportation Safety Board (NTSB) has released a preliminary report on the head-on collision between an Amtrak passenger train and CSX freight train in Cayce on Feb. 4. The accident damage was estimated at $25 million and the agency’s investigative team has looked into the dispatch system that allowed the accident to happen. The report’s findings mirror a NTSB safety recommendation released earlier this month. That recommendation requested that the Federal Railroad Administration issue an emergency order providing instructions for railroads to follow when signal suspensions are in effect and a switch has been reported relined for a main track. Now, workers will focus on replace tracks that direct Amtrak and Long Island Rail Road trains. The work could cause some track outages, but Amtrak says most of the project will be done on weekends to minimize disruptions for commuters. The Transportation Security Administration and Amtrak are testing new technology to detect concealed explosives, the TSA said Tuesday. The tests will be conducted at New York’s Pennsylvania Station in the Amtrak terminal. The Brotherhood of Locomotive Engineers and Trainmen (BLET) and Amtrak have reached a tentative contract agreement that governs rates of pay, benefits and work rules for about 1,400 locomotive engineers. Ballots and a synopsis of the agreement were mailed to active members who work for the railroad. Voting will conclude April 1, according to a BLET press release. Whenever one can write a positive report after a trip on an Amtrak long distance train it is a welcome breath of fresh air. When a positive report can be written for two consecutive trips the celebration should begin. Not that these are the only positive trips in our 40 year riding experience, but I think there is a positive culture “out there” on the rails. The first trip report was written about our September trip, and this one is our January trip from Ft. Worth to Los Angeles on the Texas Eagle/Sunset Limited; one way this trip; circumstances forced us to fly home. PORTLAND — On Monday, Feb. 26 members of the Northern New England Passenger Rail Association (NNEPRA) voted in favor of a truncated pilot program that would test running Amtrak’s Downeast Coastal Connector passenger rail service to Rockland during three weekends in August. The meeting took place at the University of Southern Maine. A former Amtrak official caught steering $30,000 in business to his wife’s photo company to take pictures of families in front of a Polar Express exhibit narrowly dodged a prison sentence Tuesday after a judge said he was inclined to impose one. Instead, U.S. District Judge Charles Kocoras ordered Benjamin Sheets, 50, to serve three months in community confinement in a deal arranged to help Sheets keep a new job he found after he was fired last fall as the head of transportation at Union Station. SAN DIEGO (CNS) – No injuries were reported Tuesday morning when an Amtrak train struck an SUV abandoned on the tracks by a suspected drunk driver in San Diego’s Little Italy neighborhood, authorities said. More than once I’ve wondered if they might be better served at a new, more modern Greyhound station that’s part of an intermodal transportation center. Some place that’s better situated for travelers than the corner of 18th and F streets, on the fringe of the city’s compact but growing restaurant and entertainment district. Like … a mile to the southeast, next door to the city’s Amtrak station. I’m not the only one who has considered the possibility. The California gas tax that took effect on November 1 is raising money for transportation projects across the state. Cities, towns and counties are applying for grants under SB1, the law that established the tax increase. A big focus of the state department of transportation, Caltrans, is to increase rail service in many places. King City in southern Monterey County wants to be on that list. City and county officials are working to get Amtrak’s Coast Starlight train to stop in King City. And stop at a rebuilt train station, said Mayor Mike LeBarre. Designed by San Francisco firm Bliss and Faville, the Sacramento Valley Station was built as a flagship depot for the Southern Pacific Railroad. By the 1970s, the 68,000-square-foot Renaissance Revival building—with its exterior of local brick and terra-cotta, and its ornate waiting room adorned with California marble, travertine, steel, bronze, and mahogany—fell into disrepair. A comprehensive new analysis finds that an April 2017 California law will generate nearly $183 billion in economic activity and user benefits throughout all sectors of the state’s economy over 10 years. The additional demand, in turn, will also support or create an average of over 68,200 jobs per year, adding up to over 682,000 job-years over the next decade—with over half coming in sectors outside of the construction industry. The 62-page analysis, conducted by American Road & Transportation Builders Association (ARTBA) Chief Economist Dr. Alison Premo Black, examines the numerous impacts of Senate Bill 1 (SB 1)—the Road Repair and Accountability Act of 2017. The measure included $5 billion annually in new investments for the state’s highways and local streets, bridges and transit systems. The Hong Kong government has unveiled its land sale programme for the new financial year from April 2018 to March 2019, including four commercial sites and 27 residential sites. Drawing the most attention is a 6-hectare commercial site above the Hong Kong terminus of the Express Rail Link connecting Kowloon to mainland China. Analysts estimate the site to be valued at as much as HK$142 billion ($18 billion) — more than five times the city’s largest-ever land sale to date. Construction crews will begin working on another section of road in Downtown Fresno as part of the High-Speed Rail Project. The Rail Authority said the closure of H Street between the Stanislaus Street Bridge and Divisadero Street will begin Monday. Crews will be conducting utility relocation work, which is expected to last about two months. Work will be conducted in two-block segments with each segment taking about two to three weeks to complete. Vice President of External Affairs for TCR Travis Kelly spoke on behalf of the High Speed Rail, attempting to clear up any misconceptions and answering questions the public has asked. The project will also build three extensions from existing Airport Rail Link (ARL): a 21km Don Muang-Phaya Thai extension, 29km Phaya Thai-Suvarnabhumi and Suvarnabhumi-U-Tapao. Transport Scotland are to study the potential for a new high-speed rail link between Glasgow and Carstairs as part of a nationwide High Speed Rail route. The feasibility report will also look at the possibility for a new interchange station at Eurocentral to enable high speed train connectivity between Glasgow and Edinburgh with London. There is lots of talk by promoters about how High Speed Rail or any rail service is too expensive and won’t attract many riders. But according to the promoters the solution is technology with either Mag-Lev or Hyperloop. But there isn’t much in the way of examples of either Mag-Lev or Hyperloop services that are successfully in service . But you do have thousands of miles of successful rail passenger service around the world, including new High Speed Rail services continuing to be built. So what’s wrong with either Mag-Lev of Hyperloop? It boils down to they often don’t get you where you want to go. PUBLIC transport companies are warning there may be some cancellations and delays to services because of the ‘Beast from the East’. A red weather warning has been issued for Dublin, Kildare, Louth, Wicklow and Meath this morning. 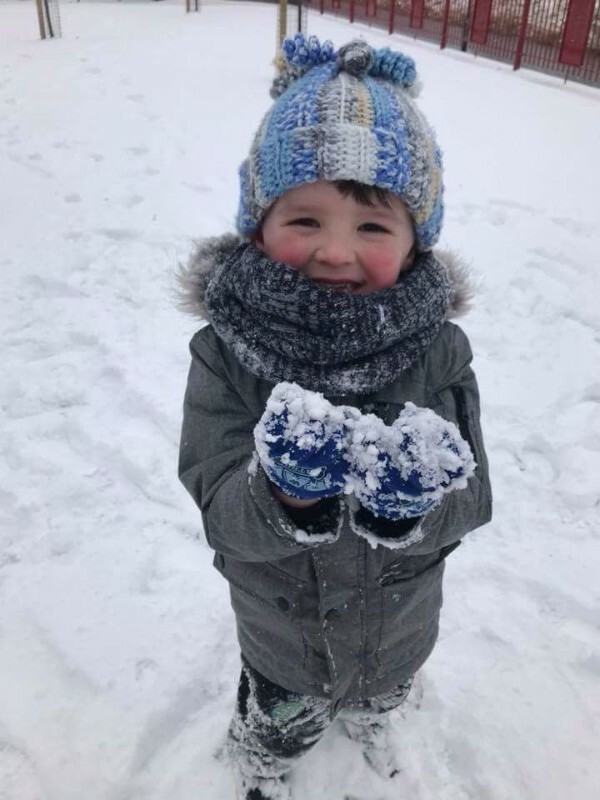 Weather experts have predicted the polar vortex will blitz the country with its worst fall in 36 years with up to 65cm (25 inches) of snowfall expected to be dumped on parts of higher ground across the country between tonight and Friday. And Irish Rail, Dublin Bus, Luas and Bus Eireann are urging customers to check their sites for updates over the coming days. A Luas spokesperson said: “Luas will operate normal passenger services this week however, this will be subject to weather conditions and advice over the coming days. “We would advise you to plan your journey in advance and allow plenty of time to travel. The latest results from California’s signature climate change program are in, and they show a third straight sellout. The state cap-and-trade program turns greenhouse gas emissions into a commodity — businesses must obtain a credit for each ton of carbon they will emit. The sellout at the latest quarterly auction of credits means the state will get about $700 million for clean energy programs and the high-speed rail project.This was also the first auction since the Canadian province of Ontario linked its cap-and-trade program with California and Quebec’s, with no apparent hiccups. But, some environmental groups have a concern — businesses are buying more credits than they need, suggesting that they’re stocking up now when prices are low and credits are numerous, to continue a higher level of emissions in the future, when the state plans to cut. California built a reputation launching some of the most ambitious climate policies in the world, but it’s also a significant oil producer, with the third largest oil production of any state. If it were to eliminate even half of that production, it could cut global carbon dioxide emissions by 8 million to 24 million tons per year, the Stockholm Environment Institute says in a new report. That’s equalivalent to as much as 5 percent of the state’s overall emissions. More bike capacity on Caltrain is needed because I’ve been denied boarding trains with my bike during peak commute hours, which is negatively impacting to my job. I’m happy that the staff has applied for funding to launch electrified service with eight-car trains to increase capacity for both seats and bikes in 2022. I’m concerned that the Caltrain staff’s current proposal for six-car electrified trains has 25 percent fewer seats and 7 percent less bike capacity than today’s trains. Caltrain ridership is up this year, bringing a mixed bag of increased fare box revenue as well as overcrowded train cars. As of January, average weekly ridership increased 3.2 percent to 57,018 from January 2017, which saw 55,271. Total fare box revenue is up 13.7 percent over that period, from $6.9 million to $7.9 million, according to a staff report. Last year saw a small dip in ridership, which Caltrain spokesman Dan Lieberman attributed to extreme weather and rain, but otherwise ridership has been growing steadily since 2010. Commuters with long rides ahead of them each day will need to remember to charge their phones and iPads before heading to BART. BART’s new and upgraded train cars, which they’ve dubbed the “Fleet of the Future,” don’t include a feature found near some seats on their older cars: outlets. The new cars are modified to handle more passengers — they include seats that take up less space to allow for more standing room — but as a result, there don’t appear to be any convenient places to put outlets. Busy Andersen Drive near West Francisco Boulevard in San Rafael will be closed for up to four months beginning Monday as commuter rail tracks are installed across the thoroughfare. The closure will be in place 24 hours a day until the work at the crossing is finished. Traffic will be rerouted off Andersen Drive to Francisco Boulevard as well as onto Woodland Avenue. San Rafael has been working with Sonoma-Marin Area Rail Transit and the Golden Gate Bridge district to bring trains through the Bettini Transit Center and to Larkspur near the ferry terminal. PITTSBURG (CBS SF) — A strong odor from an empty railroad tanker car parked on the BNSF tracks in Pittsburg Tuesday triggered a brief shelter-in-place order for a nearby neighborhood, authorities said. The incident was reported around 12:30 p.m., according to Fire Marshal Robert Marshall. Contra Costa County firefighters and Pittsburg police officers condoned off the tanker cars on N. Park side Driveway and 17th Street. San Francisco tourism slumped a bit in 2017, and the San Francisco Travel Association [SFTA] says that a one-two punch of the city’s ongoing homeless crisis and the United States in general’s declining public image in other countries is to blame. The San Diego Union-Tribune Editorial Board will let the legislative process play out more before taking a position on the bill. But so far the howls that have met it from politicians in Los Angeles and San Francisco have amounted to the same old parochial not-in-my-back-yard arguments that have driven California’s housing shortage for decades. Patch.com-Mar 2, 2018OCEANSIDE, CA – The North County Transit District will shut down Amtrak and Coaster service this weekend for infrastructure improvements, with the first disruptions going into effect late Friday evening. This morning, U.S. Senator Dianne Feinstein, Los Angeles Mayor Eric Garcetti, Inglewood Mayor James Butts, Beverly Hills Mayor Lili Bosse and other L.A. leaders celebrated the official groundbreaking for section two of the Westside Metro Purple Line subway extension. The $2.53 billion 2.6-mile heavy rail subway extension will include stops at Beverly Hills Rodeo Drive and on Constellation Boulevard in Century City. It’s the most important construction project in LA right now, and it is not a building. It’s a gargantuan subterranean structure that stretches 1.9 miles from Little Tokyo to the Financial District. When complete, it will provide a one-seat ride from Santa Monica to East LA, another from Long Beach to Azuza. That’s a distance of almost 40 miles, north to south, east to west, on one fare. A state bill to allow mid-rise, denser development near transit corridors was amended by its sponsors yesterday to address concerns raised by local planning agencies. State Senator and former District 8 Supervisor Scott Weiner (D-San Francisco) issued his first round of amendments to SB 827 to clarify that local inclusionary housing requirements would still stand and that tenant protection provisions, such as the right to return, should be upheld. Another mixed-use affordable housing complex is coming to the southern fringe of Downtown Los Angeles. Earlier today, AMCAL Multi-Housing submitted an application to the Department of City Planning to construct a five-story mixed-use building at 220 E. Washington Boulevard, featuring 109 apartments – including 108 affordable units and one manager’s unit – above 10,500 square feet of ground-floor retail space and a semi-subterranean parking garage for 57 vehicles and 122 bicycles. A four-acre south located immediately south of the Gold Line’s Monrovia Station could yield a multifamily residential complex, according to an announcement from the Monrovia City Manager. Richman Group, a Connecticut-based real estate developer, has announced plans for Station Square South, a 296-unit apartment complex at the northeast corner of Magnolia Avenue and Duarte Road. A handful of small commercial buildings would give way for the collection of five-story structures. Built in 1926, the iconic building had been decaying for 45 years at what is now the Monrovia Gold Line station at Duarte Road and Myrtle Avenue. Contractor Samuelson & Fetter started the design process for the $2.2 million restoration at the end of 2015. The company broke ground on the project in March 2017, said Nic Fetter, director of marketing, and it finished the work Feb. 16. The original William H. Mohr building is expected to house a vendor, most likely a restaurant, Fetter said, although one has not been named yet. The district defined by the City would cover the vast majority of downtown LA and is envisioned as the primary funding vehicle for a suite of transit spending including the extension of the heavy rail subway from Union Station as well as “capital improvements to the Blue / Expo Line throughout the Flower St and Washington Blvd corridors,” active transportation projects, increased bus service in southeast downtown neighborhoods, and the expansion of a 7th Street pedestrian corridor all the way to the L.A. river. Part of the feasibility study would involve gauging the revenue that could be raised over the life of the EIFD, but the tentative project list is ambitious. Based on prior Metro documents, the projects listed will likely come in somewhere over $1 billion if they involve undergrounding the Blue and Expo Lines on Flower and Washington. The projects, which have already been admitted to HCID’s Affordable Housing Managed Pipeline, would create 401 rental housing units – including 245 units of permanent supportive housing – at a total cost of $170.5 million. Approval of the request by the City Council would allow HCID to issue letters of support for the five proposed developments, which are pursuing low-income housing tax credits. This is a map of San Diego showing where construction is ongoing for both Coaster/Surfliner services and San Diego Trolley. Looking at the upper right hand side are the railroad tracks which are doubled tracked from Miramar Road down to the 52 freeway. South of the 52 the tracks are being double tracked all the way to Old Town and a few miles are also being straightened to allow faster speeds for Surfliner, Coaster and freight services. 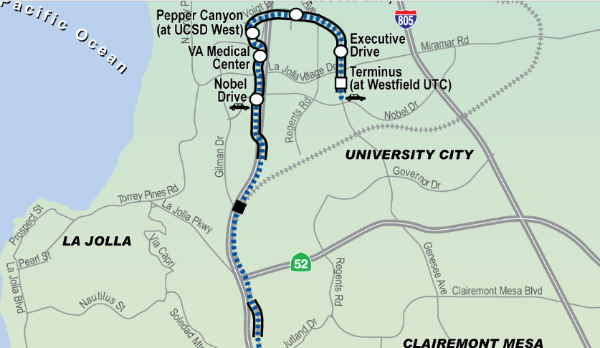 The dotted blue line shows the alignment of the $2 billion dollar extension of the San Diego Trolley Blue Line to University City. New Trolley tracks are being built north of Old Town along side of the Coaster/Surfliner/freight tracks which are also being double tracked. On the dotted blue line, the parts encased with double black lines shows where the Blue Line will be elevated. The black square at the base of Gilman Drive is for an undercrossing where the Blue Line moves to the west on its own right of way along the 5 freeway to the UCSD Campus area and University City. All that’s now missing is a joint station for transfers between Blue Line and Coaster trains near University City. The Blue Line extension is expected to be running by 2021 and the new 10.3 miles of new double tracking between the 52 and Old Town will be finished by 2020. As of this writing Amtrak has eliminated the AAA discount to its rail fares without explanation. Do you know why this has occurred? First, thank you for your comprehensive passenger rail e-news. Second, considering the gross incompetence of Amtrak, that e-news may be as close as I will get to ever riding Amtrak again. Three weeks ago from the Amtrak web site I sent an inquiry about about whether or not bags could be checked on Northeast Regional trains departing Washington Union Station. That information either was simply not available at the web site, or so obscured that after a 30 minute search I could not find it. Yesterday, after three weeks I finally got a response from Amtrak. Did it answer my simple question? NO. It directed me to phone Amtrak Customer Service, or should that be Customer Abuse, and then presumably sit on hold for 30 to 90 minutes to get an agent that would still be unable to find that information. Forget it. Now, at the Amtrak web site, I attempted to find the schedule and fare for a return trip day excursion from San Francisco to Sacramento. Impossible! There are Thruway buses that connect to Emeryville from various San Francisco locations. There are multiple trains from Emeryville to Sacramento. But the web site could present only one bus-train itinerary in late afternoon. OK, attempt two. Obviously, the bus connection is much too complicated for the web site. So, I just searched for trains. I specified return trip, entered the other required data, and clicked Find Trains. The site provides the list of trains Emeryville > Sacramento. I choose one and click Add to Cart, and that is it. The site does not then offer a list of return trains. There is no link to the Cart. Nothing. End of track. Forget it.That is just the web site. Every trip I have taken on Amtrak in the past twenty years has been compromised to some degree by incompetent service in one category or another. I travel by air five to ten times a year. It certainly has its frustrations, but in regard to competent, professional service it is in an entirely different world than the extraordinary disservice Amtrak regularly offers the public. At which I am so annoyed, that I could almost join the trumpetboy in wanting to scrap the whole mess. For those who would like an additional copy of the eNewsletter with plain text (minus photos and graphics) just email me at nbraymer@railpac.org with your name and email address. NBIf you are not a member, go to RailPAC Membership…Join Us! to get information about RailPAC and a FREE copy of our regular newsletter .